It's been several years since I played hostess over the holidays, due mainly to the fact that my kids and their families all lived so far away from me. It was easier for me, as just one person, to travel to their homes over the holidays than for all of them to pack up kids, pets and packages, and come home. So, I've become pretty good at doing Thank You cards for the hostess. and the colors came from the Tuesday challenge at The Outlawz. 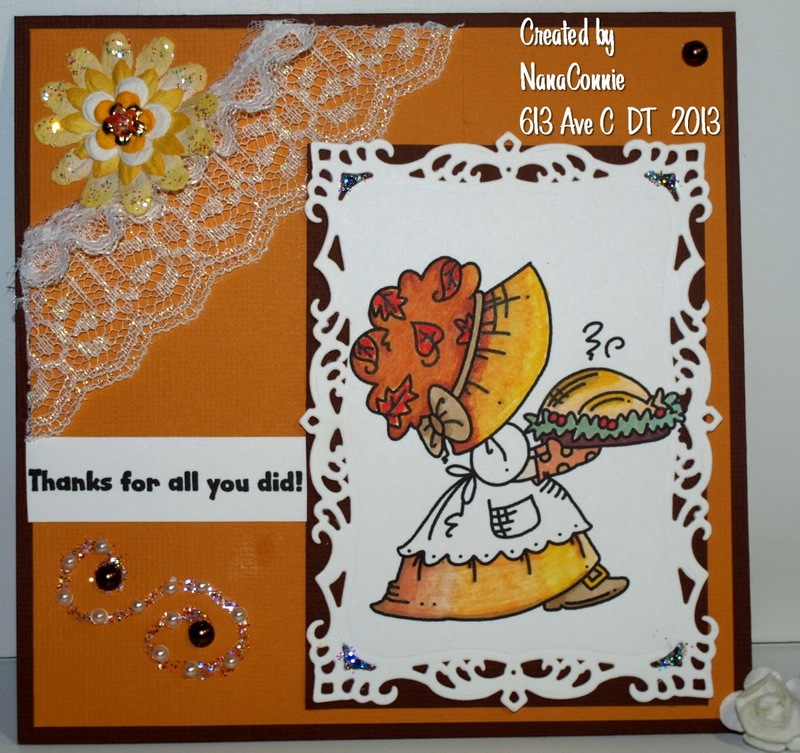 I colored Fancy Sunbonnet with ProMarkers, then die cut her using one of my favorite frame dies from Spellbinders. I matted that with charcoal CS. I found gold CS to match her dress and layered a square of it onto the dark brown card base, after adding the two bits of lace ribbon to it. I put just a touch of Stickles in each corner of the frame and the lace has its own glittery sparkle. The flower is hand made by piling up punched layers of flower petals, adding a metal flower charm to the center and using glitter on the largest layer of petals. The swirl is done with Stickles Ice, then I added pearls to it. I put one final pearl in the upper corner. The sparkle and shine don't show as well in the photo but IRL, it will just knock your socks off! Marvelous....I love that particular image on the unknown bonnet girl....haha super coloring! How super sweet! Love everything about this wonderful creation -- gorgeous coloring and the lace is a wonderful addition. What a adorable card! I love the lovely image you used! Have a great day. Adorable. Love that little character and the colors you used! I would say this looks like me for Thanksgiving dinner - but usually I look like something the cat drug in after all the work of cooking! CUTE image and colored so pretty. Fantastic. What a cute image and love it and the card done in those wonderful Fall colors. Great way to say thank you. Hi NanaConnie! I am popping in with an official hello as your new team-mate at 613 Ave C! I wanted to get to know you a bit. I am from Placerville - I see you are No. California too. A little "connection" there! I also wanted to tell you how much I like the beautiful warm colors you chose for this card. They just speak of autumn and browned turkey and the warm rich smell of Thanksgiving! I look forward to playing with you at Chana's house! Marvellous Thanksgiving card Nana Connie and love the orange shades. Fabulous colouring too! Oh NC, this is so precious outstanding design and palette, simply a beautiful card. Thanks so much for helping me while I ill.
Sweet card! I love that image and the fancy die!! Sweet image & a perfect Thanksgiving thank you card! Thanks for joining us at CFAS! That's such an awesome thank you card. just love the take on the sketch. And brilliant coloring. So beautiful! Thank you so much for sharing with us at Inky Impressions for our dies and punches challenge, good luck!! Gorgeous card...Thanks for playing along with us at Divas by Design this week. very nice ... great colors. thanks for joining us at JIC! Beautiful colour palette and so pretty! Beautiful card - love the image you've used and the lace. Thanks for joining us at Nutcrafters.